David Renfro, a native of Kingsport, Tennessee, is the Principal Horn of the Arkansas Symphony Orchestra, a position he has held since 2005. He also serves as the ASO's Director of Operations. Prior to that appointment, David taught horn and chamber music at Ouachita Baptist University and Henderson State University. He received his Bachelor of Music and Master of Music degrees in Horn Performance from the Indiana University Jacobs School of Music. His primary teachers have included Myron Bloom, Michael Hatfield, and Richard Seraphinoff. 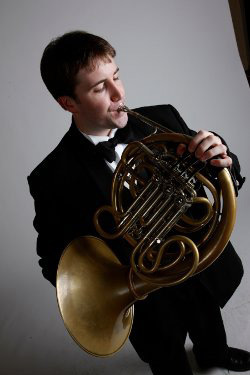 David is also principal horn of the Texarkana Symphony Orchestra and appears often with the Memphis Symphony Orchestra. In addition, David maintains an active teaching studio and performs regularly as a chamber musician and soloist. The Arkansas Democrat-Gazette lauded David's performances as soloist in Richard Strauss's Horn Concerto No. 2 with the ASO as "sparkling" and a "musical glory". Other recent solo engagements have included Mozart's Sinfonia Concertante with the Missouri Symphony Orchestra and Mozart’s Horn Concerto No. 4 with both the ASO and the Missouri Symphony Orchestra.